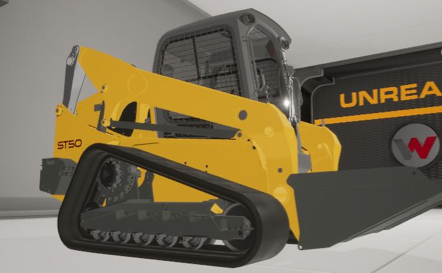 Wacker Neuson are world-known innovators in the field of construction machinery, improving how people build, work, and transport goods for over 170 years. Now VRgineers is helping them transform their manufacturing and training processes using virtual reality. Manufacturing a piece of heavy machinery like an excavator, loader, or telehandler is a very complex task. In order to create a machine the customer can fully trust, you need precision, patience, and the right tools. In order to keep manufacturing processes sophisticated and modern, the engineers and designers at Wacker Neuson need to use the latest technologies. Our company’s main use for VR in general is the visualization and evaluation of prototype vehicles. Together with the superior qualities of the VRHero, its realistic and immersive feel, it allows us to spot even tiny design flaws in early development phases and helps mitigating them. Therefore we save time and expenses at later phases and reduces the quantity of needed physical prototypes. This makes VR a viable process supplement and opens up many new possibilities regarding frontloading and development pace improvement, which reduces time to market and increases the quality of our products,” Franz Rimböck, Head of Corporate Digitalization at Wacker Neuson, said about introducing VR into the firm’s processes. Beside that, even more VR use cases are under investigation by us, to improve customer care employee training and assembly evaluation,” Rimböck added. There are many ways VRgineers can help a company like Wacker Neuson improve their business. With the new VRHero 5K Plus headset, designers can test how their drafts function in a virtual environment and change any detail in real time. Find flaws in a design before the prototyping phase. Create a whole production hall in virtual reality and walk through it. Give your workers virtual reality headsets so they can train with the new tool and test it. We are looking forward to continue our work with Wacker Neuson and helping them evolve the way they create. For more information about our virtual reality headsets and how they can revolutionize your company, click here.